If you are using a single shot botryticide between 80% Capfall and PBC we recommend you to use the best option. The botrytis fungicide SWITCH figures prominently in so many spray programs across many grape growing regions. In high risk botrytis regions growers typically plan to apply a robust botryticide at 80% capfall and then another at the pre-bunch closure stage (EL- 29). Often SWITCH provides the opportunity for that important EL-29 spray as its AWRI approval allows this timing to be used on export wine grapes, no other product approved at this timing compares on efficacy. (Remember, AWRI restrictions don’t allow SWITCH to be applied at both the key timings). However, many growers in low to medium risk botrytis areas often apply only one ‘premium’ botryticide spray in their program, often this is at the 80% Capfall timing. Many such growers are seeing the benefits of including SWITCH into their program, especially given recent experiences with some significant summer risk events. When you look at the data to support the efficacy (see figures 1 and 2) of SWITCH compared to other products, and combine this with a good understanding of the way SWITCH behaves, it becomes clear why SWITCH is the most popular botrytis product on the market. SWITCH contains 2 active ingredients which attack 4 different stages of the fungal growth, no other product in the market has this ability. SWITCH contains a Group 9 and a Group 12 component offering an important resistance management tool (whereas both Scala and Solaris contain ONLY a Group 9 component and Teldor only group 17). 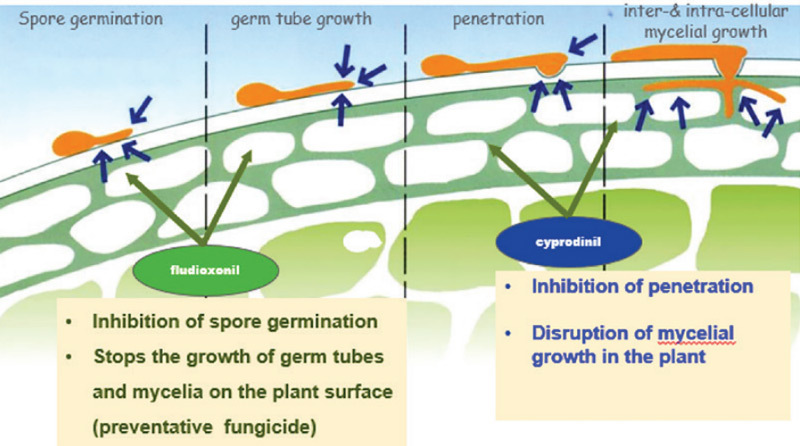 The Cyprodinil (Group 9) component in SWITCH penetrates plant tissue, cap scars and young berries to provide protection from inside whilst the Fludioxonil (Group 12) component provides a surface barrier to fungal spores germination and penetration of plant tissue. SWITCH can be applied at either the 80% Capfall timing or the EL-29 timing. Wide window for application, can be applied up to EL29 for export wine (4 weeks prior to harvest for table grapes). The fermentation process is not affected by the application of SWITCH and no taints or other impacts have been found following its use. With all this rain, we are potentially looking at a wet flowering period followed by a wet lead up to harvest. These conditions can provide a perfect recipe for botrytis.